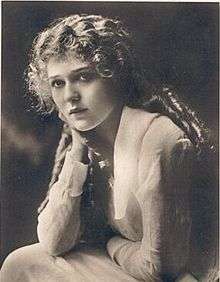 Actress Mary Pickford played a number of ingénue roles. The ingénue /ˈɑːnʒənuː/ is a stock character in literature, film, and a role type in the theatre; generally a girl or a young woman who is endearingly innocent and wholesome. Ingénue may also refer to a new young actress or one typecast in such roles. The term comes from the feminine form of the French adjective ingénu meaning "ingenuous" or innocent, virtuous, and candid. The term may also imply a lack of sophistication and cunning. Typically, the ingénue is beautiful, kind, gentle, sweet, virginal, and often naïve, in mental or emotional danger, or even physical danger, usually a target of the Cad; whom she may have mistaken for the Hero. Due to lack of independence, the ingénue usually lives with her father, husband, or a father figure. The vamp (femme fatale) is often a foil for the ingénue (or the damsel in distress). The ingénue is often accompanied with a romantic side plot. This romance is usually considered pure and harmless to both participants. In many cases, but not all, the male participant is just as innocent as the ingénue is. The ingénue is also similar to the girl next door archetype. In opera and musical theatre, the ingénue is usually sung by a lyric soprano. The ingénue stereotypically has the fawn-eyed innocence of a child, but subtle sexual appeal as well. Child, Ben (January 5, 2015). "Russell Crowe: Female Actors Should Act Their Age". The Guardian. London. Retrieved 2015-01-05. Silver, Elizabeth L. (August 19, 2013). "The Death of the Ingénue". The Millions. Retrieved 2015-01-05.